This market remains a question of historical indicators and the "real" economy vs. Fed liquidity injections. QE-Infinity (incidentally, I do believe I was the first to actually coin this term) is still in full effect, and even as I write this column the Fed is feeding the market via its primary dealer accounts, to the tune of almost $36 billion over the short-term. As expected, Bernanke's policy of "no banker left behind" has worked wonders for equities up to this point, though seems to be doing little to help the actual economy. Now for a bit of market history which may fight the Fed -- I haven't mentioned this statistic in about half a year, but it's relevant to share it with readers again today. Last week, IBM announced dismal first quarter earnings results; shares have taken a beating ever since, and dropped about 8%. This bears attention because the S&P 500 (SPX) and IBM have a correlated history when IBM trades down on earnings: 70% of the time this has happened in the past, SPX then trades lower over the next five weeks. It bears noting that the last time I mentioned this correlation was on October 22, 2012 -- and almost exactly five weeks later, the SPX reached the November bottom. That said, I'm reiterating this next point, because it's a discussion I seem to have awfully frequently with newer traders: even 70% odds still mean that exactly 3 out of 10 times, the market will end up doing the exact opposite thing. 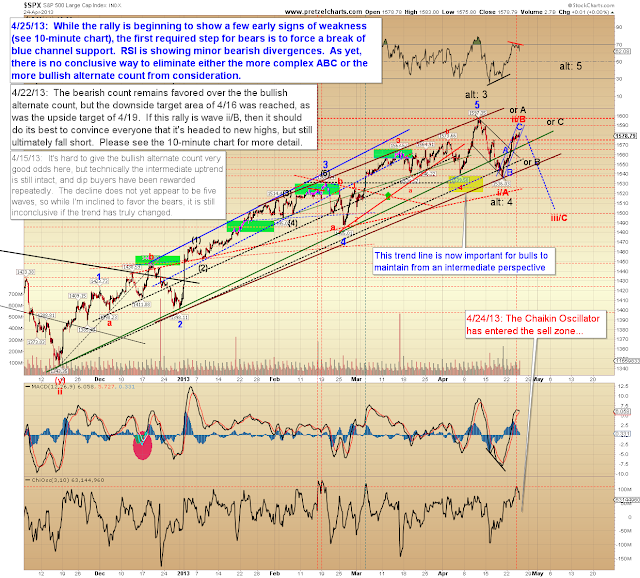 Nevertheless, it makes no sense to me to take the 30% stance -- so unless the market breaks out over long-term resistance here, I'm continuing to favor the idea that there's at least one more leg down coming. My outlook isn't coming from any sense of moral conviction about what the market is "supposed" to do next, it's purely based on the odds. To go back to my poker analogies of the past: when I'm dealt a pair of aces before the flop, I raise the bet not because I'm "predicting" the hand will win, or even because I think it "should" win -- I take action because the odds favor it will win, so raising is the correct play. Yet, as anyone who's played serious poker will tell you, the odds never guarantee anything (except frustration when they go against you!). Point being, when I see signals like I've seen in the current market, I'm inclined to sell the rallies for the same reason. A minority of the time, though, I'll be dead wrong -- but I can't actually control that part of the equation. This has sparked another thought that's probably worth sharing. In order to be successful at trading, I think one has to learn to become comfortable with the idea of uncertainty. Most of us have some difficulty with uncertainty, so we seek out ways to avoid or eliminate it, sometimes going to great lengths to do so, even if that requires we cling to a false sense of certainty. I believe this is why some analytical services have decided to take the approach of: "Mortgage the house today, because our prediction is most definitely going to happen in the market tomorrow! No doubt about it!" Personally, I view that approach as moderately irresponsible, but strangely, I believe it actually makes some people feel safer -- especially less experienced traders -- which means that approach probably brings in new subscribers for those services. Ironically, to my way of thinking, less experienced traders are exactly the people who don't want to be feeling any level of over-elevated conviction. Trading is hard enough already -- but it's ten times harder once a sense of conviction engages our emotions and our egos. Anyway, that's just how I view it. So let's talk about what is most definitely, without a doubt, for sure going to happen today! Get set to mortgage the house, because I'm givin' ya gems here! Ready? What will most certainly happen today (and there is almost no doubt in my mind!) is: the sun will rise. You heard it here first! 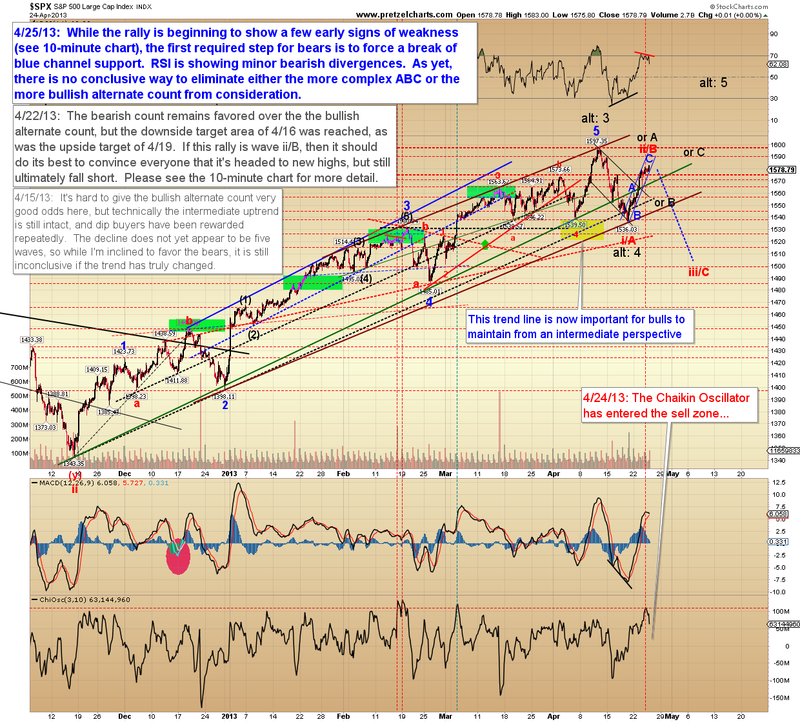 As far as the market goes, though, we're still in the inflection zone -- so the bears will either get it done here, or they won't. 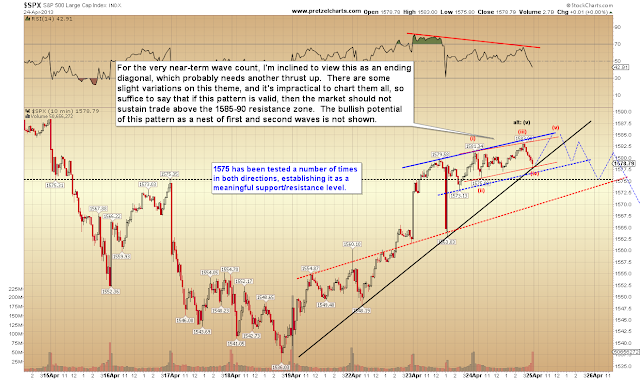 The second 10-minute chart attempts to interpret the near-term wave structure. This is actually a pretty funky wave form going back to the 1536 swing low, so if you're trading this, then please do so cautiously. 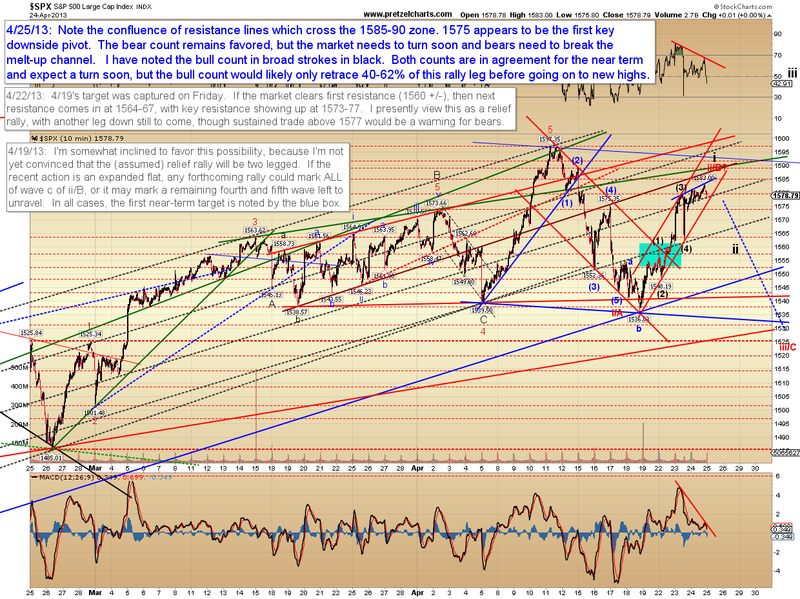 In conclusion, I remain in favor of the bear view, but it's make or break time for that view. Trade safe. Thanks for the excellent tip. Going long today on SUN x3 leveraged ETF. like using more of our prefrontal cortex, the world would probably be a better place. You haven't been reading for very long, have you? 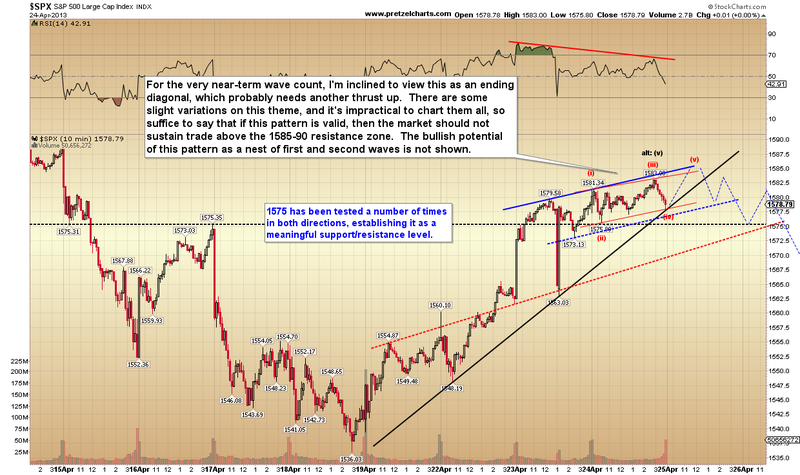 I was bullish for the vast majority of the rally since November and only started looking for a top recently. Deadeye, come back when you learn how to read! Great read as always, Pretzel. Hope things are good at home. must have been a lonely day in the woods for the trolls... why don't you go check out this site: http://danericselliottwaves.blogspot.com/ ...you will prolly fit in nicely over there..